Ariana Grande counts the First Wives Club as one of her favorite films. Please review the evidence below. So for her recent performance of her reflective, hopeful break-up song “thank u, next” on The Ellen Show, Grande decided to put her own spin on the movie’s iconic “You Don’t Own Me” scene, transforming Ellen’s stage into an empty wedding reception hall. 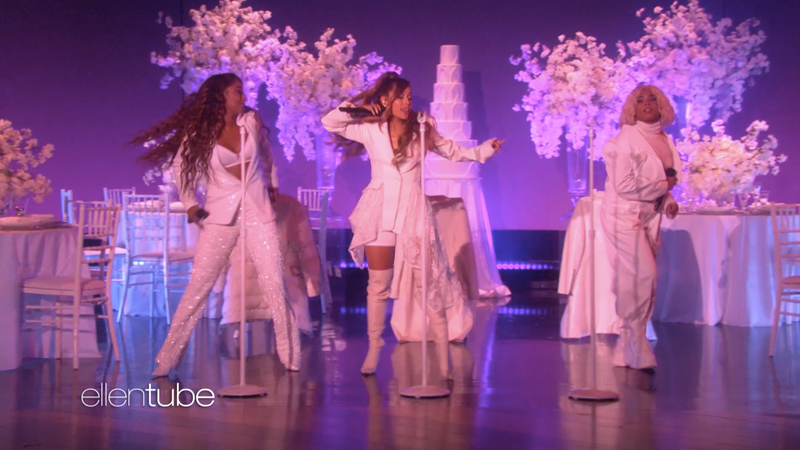 Aside from the wedding scenery and matching white blazers, Grande’s performance is charmingly understated. She trips at one point on a chair, yelling, “Oh my god!” but picks the song right back up, later laughing at herself when she catches the eye of one of her singers. And when she gets to the lyric about her mom and dad, it sounds like Grande is tearing up a little. It’s such a great performance and overall, whether you like her or not, it’s been incredible to witness how much she’s grown as an artist this year. Just four years ago, she was releasing indecipherable EDM and shooting cannons out of her bra in music videos (not that “Break Free” wasn’t a banger!) But it’s refreshing seeing this side of her and I assume, for Grande, liberating as well.